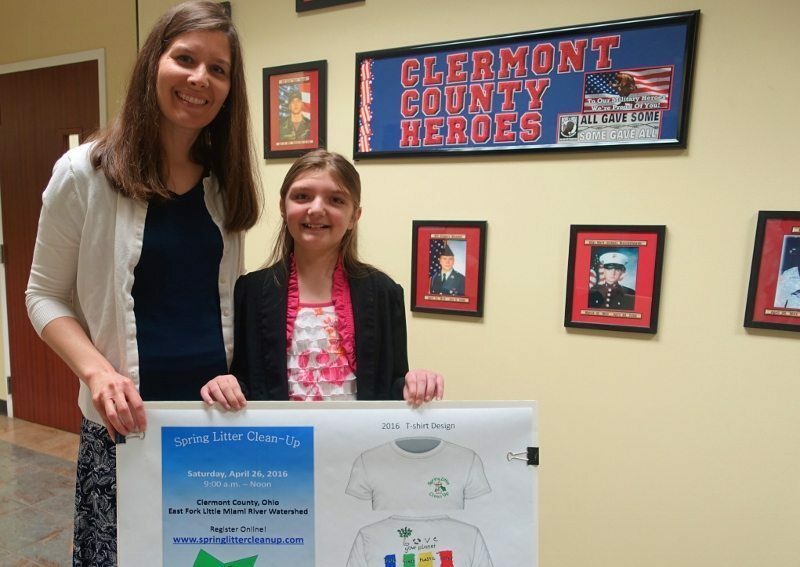 BATAVIA, Ohio (March 7, 2016) — A fourth-grader from New Richmond Elementary was recognized by the Clermont County Commissioners for her winning design in the second annual Spring Litter Clean-Up T-shirt Design Contest. Karley Wrigglesworth and her teacher, Meredith Zimmerman, were given certificates of appreciation by Commissioner David Uible on March 7 for contributing to local education efforts to promote litter prevention and recycling. The litter clean-up is scheduled for Saturday, April 23. SWCD Administrator John McManus shows Karley’s design. Judie Kocica, center, Karley Wrigglesworth, and Carrie McIntosh-Owens of SOAR, a sponsor of the contest. 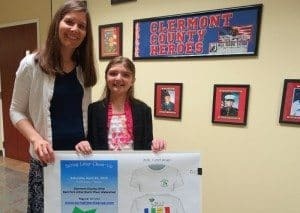 The Southern Ohio Association of Realtors (SOAR) and Clermont County Convention & Visitors Bureau (CVB) sponsored the contest and awarded Karley a $100 prize, plus an additional $100 prize for the New Richmond Elementary School art department. 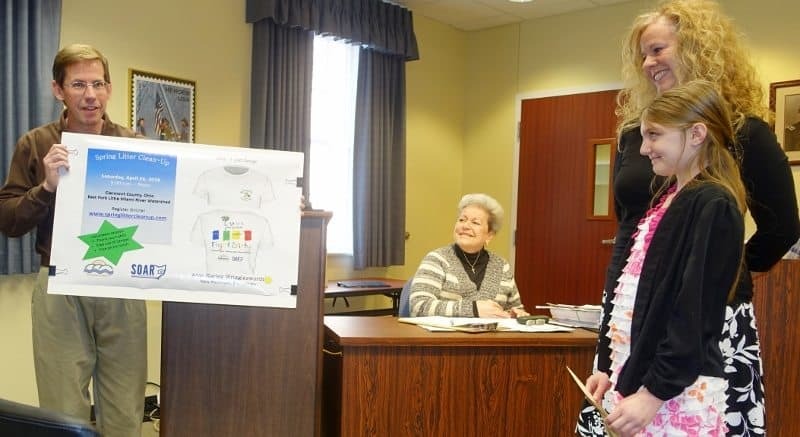 Karley’s design was chosen from 82 entries submitted by K-12 students throughout Clermont County and the East Fork Little Miami River watershed. Karley said she learned about the contest at school from her teacher. One day, after school, when she went home, Karley said, “My mom had a bunch of markers. We got a few T-shirts out and started working on them.” Karley was the only entrant to do her design on an actual T-shirt. The annual Spring Litter Clean-Up, coordinated by the East Fork Watershed Collaborative and Valley View Foundation, is an all-volunteer effort to enhance local communities by cleaning up parks, streams and lakes, and other community areas. 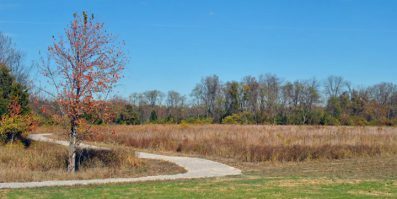 “We appreciate the willingness of volunteers to protect our natural resources, including East Fork Lake,” said Mark Calitri, Executive Director for the CVB. “Clermont County hosts many important events at the lake and surrounding communities; we’re proud to support the volunteers and this event,” he added. “It helps people learn to take care of the planet,” said Karley about the Spring Litter Clean-Up. “Plus it is a fun event for people to go out and pick up things.” She said she planned to be out on April 23 doing her part to clean up Clermont County. Teacher Meredith Zimmerman and Karley Wrigglesworth. SOAR is not only helping to sponsor the event, but has also organized its members to participate the day of the event. “Hundreds of volunteers participate each year to clean up sites across Clermont County and the East Fork watershed and we’re proud to do our part,” said Carrie McIntosh-Owens, Board President for SOAR. Online registration for the April 23 event is open: http://www.springlittercleanup.com/. For more information, contact Clermont Soil & Water Conservation District at 513-732-7075.